St. George was born of noble Christian parents. Due to his physical strength and beefy body he took the profession of soldier. After some time due to his courage and actions he became a colonel in the army. The Emperor Dioclesian hearing of his courage wanted him for a higher station. When the Emperor Dioclesian began to wage war against the Christian Religion St. George gave up his high post he assumed. He then proceeded to complain to the Emperor Dioclesian of his unjust actions toward the Christians due to the fact that they were bloody actions and decrees he enforced. The Emperor Dioclesian having heard this casted St. George into prison. St. George's faith and consistency was tried first by promises. Consequently, the Emperor seeing the promises failing to work, proceeded to have St. George to be tortured with great savagery. In the end, nothing daunted our great St. George. The next day his body was seen decapitated and the whole city saw St. George's headless body. How then is St. George a patron saint of Soldiers? Firstly it was due to his profession as a military man, St. George being himself a colonel in an army. Secondly there was a relation of his appearing to the Christian Army in the holy war before the battle of Antioch. The battle results favoring the Christians, who at the time was under Godfrey of Bouillon, made St. George widely known in Europe, and beseech military men to prayer for his intercession. This devotion was fulfilled in an apparition to the King Richard I who St. George appeared to in his campaign against the Saracens. After this being declared to the troops was a great encouragement, and the Christians soon defeated the Saracens, their enemy. It is related also that Byzantine historians relate numerous battles have been gained through St. George's intercession as well as many other miracles wrought in his intercession. 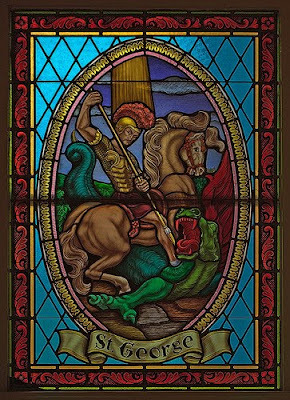 St. George is usually depicted in paintings on horseback learning toward the dragon under his feet. This representation shows that by his faith and fortitude he conquered the devil, also know as the dragon in the Apocalypse.